Singapore certainly is a vibrant place, and in many ways Orchard Road is the city-state's beating heart. 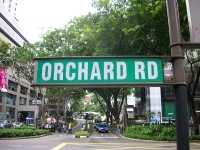 The retail and entertainment centre of Singapore, 'Orchard' (as the surrounding area is commonly known) is as popular with locals as it is with foreign visitors, and for many years has been Singapore's prime tourist hotspot. At the southern end of Orchard Road you will find The Istana (the official residence of the Singaporean president), and at the northern end the immensely popular Botanic Gardens; while in between there is a pulsing street lined with pedestrian malls and department stores, offering some of the best shopping opportunities in Asia. Must-see places include Tangs, the first upmarket department store in Singapore, and the Tanglin Mall, which features an enormous food court that is incredibly popular with tourists and expatriate workers in Singapore. There is an almost inexhaustible range of stores and boutiques in Orchard Road, and plenty of upmarket cafes and restaurants serving international cuisine of the highest order. Make sure to leave some room in your suitcase, as shopping in Orchard Road is an irresistible tourist activity in Singapore.